The Kansai region(関西地方,Kansai-chihō) or the Kinki region(近畿地方,Kinki-chihō) lies in the southern-central region of Japan's main island Honshū. 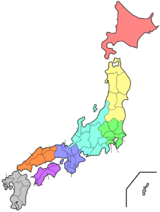 The region includes the prefectures of Mie, Nara, Wakayama, Kyoto, Osaka, Hyōgo and Shiga, sometimes Fukui, Tokushima and Tottori. While the use of the terms "Kansai" and "Kinki" have changed over history, in most modern contexts the use of the two terms is interchangeable. The urban region of Osaka, Kobe, and Kyoto (Keihanshin region) is the second-most populated in Japan after the Greater Tokyo Area. A prefecture is an administrative jurisdiction or subdivision in any of various countries and within some international church structures, and in antiquity a Roman district governed by an appointed prefect. Mie Prefecture is a prefecture of Japan, which is part of the Kansai region on the main Honshu island. The capital is the city of Tsu. The Kansai region is a cultural center and the historical heart of Japan, with 11% of the nation's land area and 22,757,897 residents as of 2010. The Osaka Plain with the cities of Osaka and Kyoto forms the core of the region, from there the Kansai area stretches west along the Seto Inland Sea towards Kobe and Himeji and east encompassing Lake Biwa, Japan's largest freshwater lake. In the north, the region is bordered by the Sea of Japan, to the south by the Kii Peninsula and the Pacific Ocean, and to the east by the Ibuki Mountains and Ise Bay. Four of Japan's national parks lie within its borders, in whole or in part. The area also contains six of the seven top prefectures in terms of national treasures. Other geographical features include Amanohashidate in Kyoto Prefecture and Awaji Island in Hyōgo. The Osaka Plain refers to a 1,600 km² area of flat land, the largest plain in the Kinki region, including a large part of Osaka Prefecture and a southeastern portion of Hyōgo Prefecture. It is bordered on the north by the Hokusetsu Mount Range, on the east by the Ikoma Mount Range and Kongō Mount Range, on the south by the Izumi Mount Range, and on the west by Osaka Bay. On occasion, it is called the Sekkasen Plain after the names of former Settsu Province, Kawachi Province and Izumi Province. Kyoto, officially Kyoto City, is the capital city of Kyoto Prefecture, located in the Kansai region of Japan. It is best known in Japanese history for being the former Imperial capital of Japan for more than one thousand years, as well as a major part of the Kyoto-Osaka-Kobe metropolitan area. The Seto Inland Sea, also known as Setouchi or often shortened to Inland Sea, is the body of water separating Honshū, Shikoku, and Kyūshū, three of the four main islands of Japan. The region that includes the Seto Inland Sea and the coastal areas of Honshū, Shikoku, and Kyūshū is known as the Setouchi Region. It serves as a waterway, connecting the Pacific Ocean to the Sea of Japan. It connects to Osaka Bay and provides a sea transport link to industrial centers in the Kansai region, including Osaka and Kobe. Before the construction of the San'yō Main Line, it was the main transportation link between Kansai and Kyūshū. 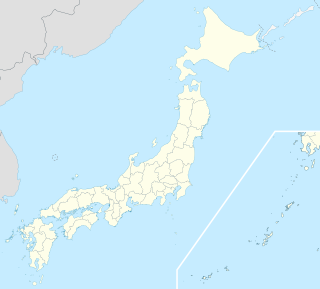 The Kantō region is a geographical area of Honshu, the largest island of Japan. The region includes the Greater Tokyo Area and encompasses seven prefectures: Gunma, Tochigi, Ibaraki, Saitama, Tokyo, Chiba, and Kanagawa. Within its boundaries, slightly more than 45 percent of the land area is the Kantō Plain. The rest consists of the hills and mountains that form the land borders. According to the official census on October 1, 2010 by the Japan Statistics Bureau, the population was 42,607,376, amounting to approximately one third of the total population of Japan. Takoyaki (たこ焼き or 蛸焼) is a ball-shaped Japanese snack made of a wheat flour-based batter and cooked in a special molded pan. It is typically filled with minced or diced octopus (tako), tempura scraps (tenkasu), pickled ginger, and green onion. Takoyaki are brushed with takoyaki sauce and mayonnaise, and then sprinkled with green laver (aonori) and shavings of dried bonito. There are many variations to the takoyaki recipe, for example, ponzu, goma-dare or vinegared dashi. 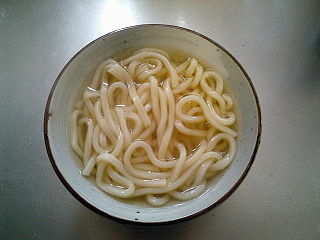 Udon is a type of thick wheat flour noodle used frequently in Japanese cuisine. It is often served hot as a noodle soup in its simplest form, as kake udon, in a mildly flavoured broth called kakejiru, which is made of dashi, soy sauce, and mirin. It is usually topped with thinly chopped scallions. Other common toppings include tempura, often prawn or kakiage, or aburaage, a type of deep-fried tofu pockets seasoned with sugar, mirin, and soy sauce. A thin slice of kamaboko, a halfmoon-shaped fish cake, is often added. Shichimi can be added to taste. The dialects of the people from the Kansai region, commonly called Kansai-ben , have their own variations of pronunciation, vocabulary, and grammar. Kansai-ben is the group of dialects spoken in the Kansai area, but is often treated as a dialect in its own right. 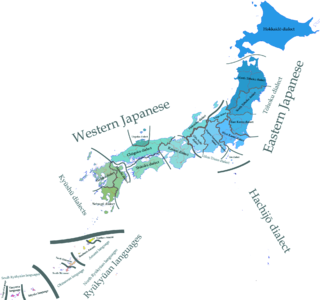 The dialects of the Japanese language fall into two primary clades, Eastern and Western, with the dialects of Kyushu and Hachijō Island often distinguished as additional branches, the latter perhaps the most divergent of all. The Ryukyuan languages of Okinawa Prefecture and the southern islands of Kagoshima Prefecture form a separate branch of the Japonic family, and are not Japanese dialects, although they are sometimes referred to as such. The Kansai dialect is a group of Japanese dialects in the Kansai region of Japan. In Japanese, Kansai-ben is the common name and it is called Kinki dialect in technical terms. The dialects of Kyoto and Osaka, especially in the Edo period, are also called Kamigata dialect. The Kansai dialect is typified by the speech of Osaka, the major city of Kansai, which is referred to specifically as Osaka-ben. It is characterized as being both more melodic and harsher by speakers of the standard language. The terms Kansai( 関西 ), Kinki( 近畿 ), and Kinai ( 畿内 ) have a very deep history, dating back almost as far as the nation of Japan itself. As a part of the Ritsuryō reforms of the seventh and eighth centuries, the Gokishichidō system established the provinces of Yamato, Yamashiro, Kawachi, Settsu and Izumi. Kinai and Kinki, both roughly meaning "the neighbourhood of the capital", referred to these provinces. In common usage, Kinai now refers to the Osaka-Kobe-Kyoto (Keihanshin) area, the center of the Kansai region. Kansai (literally west of the tollgate) in its original usage refers to the land west of the Osaka Tollgate (逢坂関), the border between Yamashiro Province and Ōmi Province (present-day Kyoto and Shiga prefectures). During the Kamakura period, this border was redefined to include Ōmi and Iga Provinces. It is not until the Edo period that Kansai came to acquire its current form. (see Kamigata ) Like all regions of Japan, the Kansai region is not an administrative unit, but rather a cultural and historical one, which emerged much later during the Heian Period after the expansion of Japan saw the development of the Kantō region to the east and the need to differentiate what was previously the center of Japan in Kansai emerged. In 1913, Canadian Methodist Academy opened its doors to sixteen children. The school, renamed Canadian Academy in 1917, served children of missionary parents from grade one through high school and offered boarding facilities for students from throughout Asia. Today, the day and boarding school offers a PreK to Grade 12 education on the campus on Rokkō Island, a man-made island. The school, which is no longer affiliated with Canada or the church, is the largest school for expatriates in Kansai. The school is approved by the Japanese Ministry of Education and accredited by the Western Association of Schools and Colleges(WASC) and the Council of International Schools. The school awards both the International Baccalaureate (IB) and U.S. high school diplomas. In 1946, St. Michael's International School was established by Anglican Bishop Michael Yashiro and Miss Leonora Lee, a British missionary. Today, the school offers a distinctive British-style primary education based on the National Curriculum of England and Wales. The school has joint accreditation from the Council of International Schools and the Western Association of Schools and Colleges. Brother Charles Fojoucyk and Brother Stephen Weber founded Marist Brothers International School in 1951 after communist authorities pressured them to leave Tientsin, China. Today, the international Montessori - Grade 12 school enrolls approximately 300 students. The school is accredited by the Western Association of Schools and Colleges. In 1957, a missionary homeschooled her son, his best friend and another student in their home. The next year, the home turned into Kyoto Christian Day School and a full-time teacher was hired. The school was renamed Kyoto International School in 1966. Today, the school serves students from two to fourteen years old. The school has bee accredited by the Western Association of Schools and Colleges (WASC) since 1992 and authorized by the International Baccalaureate Organisation (IBO) since 2006. 1 2 Ministry of Internal Affairs and Communications Statistics Bureau (26 October 2011). "平成 22 年国勢調査の概要" (PDF). Retrieved 6 May 2012. ↑ "International comparison of GDP of Japan's Prefectures: Tokyo's GDP is bigger than Indonesia's?!". realestate.co.jp. 13 August 2015. Archived from the original on 1 May 2018. Retrieved 3 February 2017. ↑ "Yearly Average Rates". UKForex. Archived from the original on 16 March 2015. Retrieved 3 February 2017. ↑ Nussbaum, Louis-Frédéric. (2005). "Kansai" in Japan Encyclopedia, p. 477 , p. 477, at Google Books. ↑ "Mie Prefecture homepage: About Mie (pdf)" (PDF). Archived from the original (PDF) on 2008-04-08. Retrieved 2008-04-10. ↑ "Kansai Region Travel Guide - Kinki Region Travel Guide". www.japan-guide.com. Retrieved 2018-08-13. ↑ "Kansai - JapanGov". JapanGov. Retrieved 2018-08-13. ↑ Planet, Lonely. "Kansai travel - Lonely Planet". Lonely Planet. Retrieved 2018-08-13. 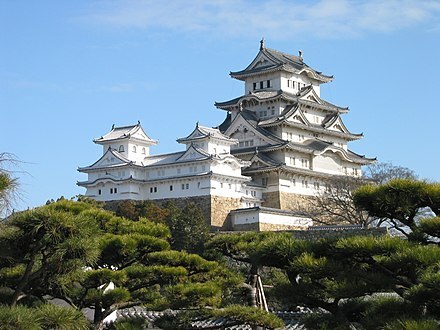 ↑ "Kansai | JapanVisitor Japan Travel Guide". www.japanvisitor.com. Retrieved 2018-08-13. ↑ "8 Tips for Travelling in Japan's Kansai Region". TripZilla. 2016-01-29. Retrieved 2018-08-13. ↑ Nussbaum, "Kinai" in p. 521 , p. 521, at Google Books. ↑ "School History: DSK International - World IB School in Kobe". DSK International. Retrieved 2018-11-28. ↑ "Canadian Academy: History". www.canacad.ac.jp. Retrieved 2018-11-28. ↑ "About". www.smis.org. Retrieved 2018-11-28. ↑ "Our History - Marist Brothers International School". www.marist.ac.jp. Retrieved 2018-11-28. ↑ "History - Kyoto International School". Kyoto International School. Retrieved 2018-11-28. Nara Prefecture is a prefecture in the Kansai region of Japan. The capital is the city of Nara. 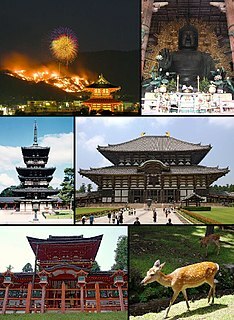 Nara Prefecture has the distinction of having more UNESCO World Heritage Listings than any other prefecture. Kyoto Prefecture is a prefecture of Japan in the Kansai region of the island of Honshu. Its capital is the city of Kyoto. Keihanshin is a metropolitan region in Japan encompassing the metropolitan areas of the cities of Kyoto in Kyoto Prefecture, Osaka in Osaka Prefecture and Kobe in Hyōgo Prefecture. The entire region has a population of 19,341,976 over an area of 13,033 km2 (5,032 sq mi). It is the second-most-populated urban region in Japan, containing approximately 15% of Japan's population. Kansai Telecasting Corporation, often called Kansai TV or Kantele (関テレ), is a tv station affiliated with Fuji News Network (FNN) and Fuji Network System (FNS) in Osaka, serving the Kansai region of Japan. Kansai TV is a company affiliated in Hankyu Hanshin Holdings Group of Hankyu Hanshin Toho Group. Yomiuri Telecasting Corporation is a TV station in Osaka Business Park, Osaka, Japan, which serves the Kansai region, and is affiliated with the Nippon News Network (NNN) and Nippon Television Network System (NNS). Founded as New Osaka Television Co. on February 13, 1958, and renamed "Yomiuri Telecasting Corporation" on August 1, the station started broadcasting on August 28 as the first TV station to be affiliated with Nippon Television Network Corporation. Sun Television Co. is a commercial television station headquartered in Kobe, Hyōgo Prefecture, Japan, and a member of the Japanese Association of Independent Television Stations (JAITS). National Route 1 is a major highway on the island of Honshū in Japan. It connects Chūō, Tokyo in the Kantō region with the city of Osaka, Osaka Prefecture in the Kansai region, passing through the Chūbu region en route. It follows the old Tōkaidō westward from Tokyo to Kyoto, and the old Kyo Kaidō from there to Osaka. Between Tokyo and Aichi Prefecture it parallels the Tomei Expressway; from there to Mie Prefecture, the Higashimeihan Expressway, and from Shiga Prefecture to Osaka, the Meishin Expressway. Its total length is 565.4 kilometres (351.3 mi). At its eastern terminus in Nihonbashi, Chūō, Tokyo, it meets National Routes 4, 6, 14, 15, 17, and 20. At its western terminus in Umeda, Kita-ku, Osaka, it links with Routes 2, 25, 26 and other highways. This page lists Japan-related articles with romanized titles beginning with the letter H. For names of people, please list by surname. Please also ignore particles when listing articles. 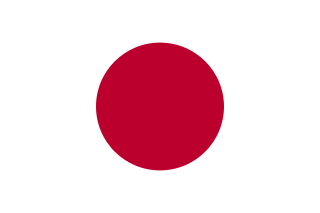 This page lists Japan-related articles with romanized titles beginning with the letter K. For names of people, please list by surname. Please also ignore particles when listing articles. This page lists Japan-related articles with romanized titles beginning with the letter T. For names of people, please list by surname. Please also ignore articles when listing articles. The Kinki Evangelical Lutheran Church or KELC is a Lutheran church in Japan. It currently has approximately 2,759 baptized members in 29 congregations nationwide. Transport in the Keihanshin metropolitan region is much like that of Tokyo: it includes public and private rail and highway networks; airports for international, domestic, and general aviation; buses; motorcycle delivery services, walking, bicycling, and commercial shipping. The nexus is in the central part of Osaka, though Kobe and Kyoto are major centers in their own right. Every part of Keihanshin has rail or road transport services. The sea and air transport is available from a limited number of ports for the general public. The Central Army is one of five active Armies of the Japan Ground Self-Defense Force. It is headquartered in Itami, Hyōgo. Its responsibility is the defense of Chūgoku, Kansai, Shikoku and the Southern half of the Chūbu region. Kansai Soccer League (関西サッカーリーグ) is a Japanese football league covering most of the Kansai region, the prefectures of Hyōgo, Kyōto, Nara, Osaka, Shiga and Wakayama. Mie, usually considered part of Kansai in non-football usage, is allotted to the Tōkai Soccer League. Wikimedia Commons has media related to Kansai region . Wikivoyage has a travel guide for Kansai .